Exide is the world’s most popular and proven large capacity sealed battery. Absolyte GP batteries are made specifically for PV applications. Absolyte GP batteries have proven high performance in the field for 15 years. Designed for large-scale industrial applications that require low maintenance and long life. 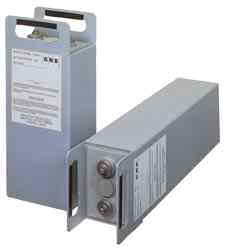 Sealed, valve regulated battery includes racking, mounting hardware and covers. • Patented lead calcium tin silver alloy provides 1200 cycles to 80% D.O.D. and a twenty year life in float service @ 25°C (77°F) with proper charging. Positive Plate — Patented MFX grid alloy.